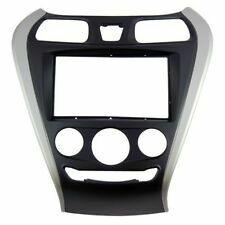 Fascia for Hyundai Elantra Avante HD 2006-2010 facia plate mount panel dash kit. Material: High Quality ABS Plastic. CARAV 11-065 Car Radio Install Dash Kit. Inner size : (CARAV 11-065). CARAV 11-065 Car Radio Installation Trim Fascia Panel. HYUNDAI Elantra (HD), Avante (HD) 2006,2007,2008,2009,2010. Special For:HYUNDAI(Left wheel). Recessed DIN opening Metra patented Snap-In ISO Support System Contoured to match factory dashboard Comes with oversized under-radio storage pocket High-grade ABS plastic Comprehensive instruction manual All necessary hardware for easy installation . NEW IN OPEN MANUFACTURES BOX. COMPLETE SET ----->AS PICTURED. (Sx3) BOX SHOWS SIGNS OF WEAR. The kit is made out of factory textured ABS plastic. It includes fully adjustable ISO mounting brackets, instructions and mounting hardware. Color finish is Black. This is what most consider the hardest part of the installation. 2006 Hyundai Sonata Single DIN with Pocket or Double DIN ISO. Pocket OR Double DIN ISO. Hyundai Elantra GT 2013-up. Painted high gloss black. We are committed to providing you a quality product at the lowest prices possible. • We strongly encourage professional installation of any electronic devices. Radio Installation Kits. Amplifier Install Kit. Besides cost it is likely to delay the order. After that we will put the item back for sale. Self installation voids the warranty if any. We may require receipt of professional installation/bench Test report to establish it was professionally installed and the issue was with the product and not installation. 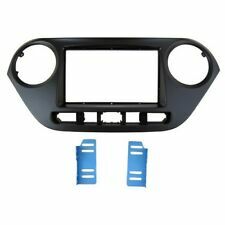 ISO DIN head unit provision with pocket Double DIN head unit provisions Painted black to match factory finish Wiring Harness: 70-7304 – for Kia/Hyundai harness 2010-up Antenna Adapter: Not Required . Metra patented Quick Release Snap In ISO mount system with custom trim ring Built in oversized storage pocket with built in radio supports Recessed DIN opening Contoured and textured to match factory dash Hyundai Entourage 2007-2008 Kia Sedona 2006-2014 . Metra patented Quick Release Snap In ISO mount system with custom trim ring. Contoured and textured to match factory dash. Recessed DIN opening. Comprehensive instruction manual. All necessary hardware to install an aftermarket radio. .
Antenna Adapter Painted black to match factory finish. Wiring and Antenna Connections. Warranty: 1 year. Metra patented Quick Release Snap In ISO mount system with custom trim ring Recessed DIN opening Comes with oversized under radio storage pocket High grade ABS plastic contoured and textured to compliment factory dash Comprehensive instruction manual All necessary hardware to install an aftermarket radio Painted to match bronze OEM color and finish . 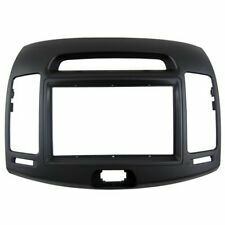 Fascia for Hyundai i-30 2008-2011 facia panel dash kit face plate cover trim. this model only fit left wheel countries, not suitable for right wheel countries. Complete SET! -----> AS PICTURED!